Killing off the Adverbs – But, I really, really, really like them. “Adverbs are not your friends,” wrote the man responsible for my wedging a chair under the door knobs of my closet keeping kid-eating clowns contained along with Hammer-pants, scrunchies, and other fashion faux pas of the nineties. Now, taking a class on revisions taught by Suzanne Purvis at Lawson Writing Academy, my love-hate relationship with all-things Stephen King is deepening. 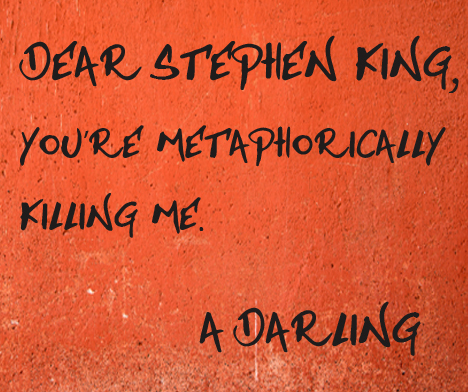 I mean this respectfully, because… duh, he’s Stephen King. He scared the bejesus out of me in high school. He made me cry, ugly, fat tears at the sacrifices people make for love. The man hits me in the feels. I haven’t read everything he’s ever written, because he’s not writing everything for me. I’m sure he’s not offended. What I do read draws me in, like the scent of cinnamon at the mall, creating a craving for all the words. Then, later, after the euphoria dissipates I’m left hung-over in world that has me hugging my children tightly and promising to love them forever, or walking with a can of mace and taser. I want to write like that. That, requires me to kill my darling adverbs. “But they’ll still be there in the first draft, because, I really like adverbs,” she said forlornly. What do you love, but you shouldn’t? Your crutch? Your Achilles-heel? I’d love to hear from you.